It was one of those days, a long one, replete with delays and crabby passengers and thunderstorms. After 12 hours on duty, five legs, and three different airplanes, my crew welcomed the approach of the jetway at the Huntsville International Airport like a marathon runner rejoices at the sight of the banner. On such days, the Walter Mitty in me always conjures an image of my crew, in fleece-lined bomber jackets, nursing a tattered B-17 across the English Channel with one main gear hanging down and smoke trailing from a couple of engines. Needless to say, I was ready for the hotel. Unfortunately, there was a reading light out at 24 A to be written up and called in. I went back to check on it. The light was indeed out, and no amount of bulb wiggling was going to resurrect it. So with my crew yawning and tapping their watches, I called maintenance control. Finished, I headed out to the jetway. It was then that I realized my reading glasses were AWOL. I retraced my steps. I went back to the cockpit. I checked the galley. I walked back to 24 A and enlisted the help of the cleaning crew who were already moving through the cabin, sweeping up crumbs and plucking used Kleenexes from seat back pockets. No joy. I gave up. As I walked forward again, disgusted at myself for losing yet another pair of glasses, I noticed a smudge on my glasses and took them off to wipe them with a cloth…yes, I know. Things like that never used to happen to me. There was a time when I didn't lose my glasses on my own face, when I didn’t forget the assigned heading 10 seconds after the tower gave it to me, when I could fly five legs on three different airplanes without collapsing in a heap in the back of the hotel van. We all grow old, if we are lucky. There is a price to be paid, though. In my case, my perfect 20/20 vision was the first thing to go. A few days after my birthday in 2008, I went in to renew my Class 1 medical. My M.E., an otherwise nice guy, smiled and said, ominously, “now that you are in your forties, you will discover that your near vision will deteriorate.” I laughed this off much as I do his semi-annual suggestion to “take off a few pounds.” But, sadly, this time Nostradamus was right. I went home that night, sat down to read the newspaper, and realized that my arms were shorter than they used to be. I couldn’t hold the paper far enough away to focus clearly. It was almost as if he had jinxed me. This aging stuff is a tough business. Other things follow, of course, inevitably. Even the forces of nature seem to work against you. You bend down to retrieve the flight release your uncoordinated fingers scattered on the floor of the weather room and discover that the ground has gotten farther away despite the fact that you are not any taller. You pick up the admittedly over-packed crew bag you have carried for years and discover that somehow the Earth’s gravitational constant has increased while you slept. It’s a sad but common story. 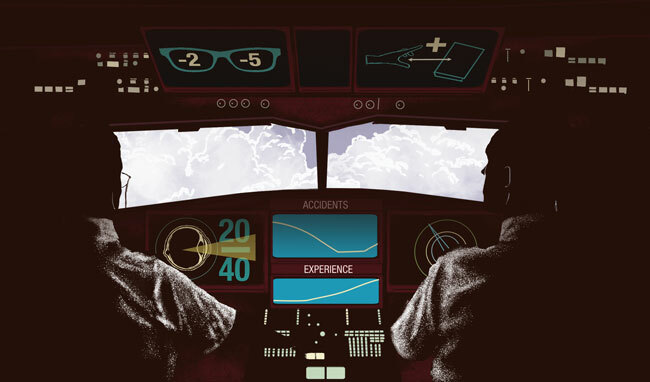 In a previous article I explored the role of experience in making one a better pilot. I optimistically said that hours in the logbook make a difference, that practice makes perfect. These assertions may well be true. Accident statistics tell a more complicated story. In 2012, the AAA Foundation for Traffic Safety commissioned a study on the effects of aging on driving. Their first observation, which should gratify you aging curmudgeons out there, is one you long suspected: Teenagers are terrible drivers. The AAA study shows that drivers under 17 had 2,152 crashes per 100 million miles driven. Drivers 18-19 years old fare only slightly better at 1,132. With age and presumably wisdom, these rates fall steadily. Drivers in the 20-24 bracket have 797 crashes per 100 million miles. The 25-29-year-olds have 532. The 30-39-year-olds do even better at 404, as do 40-49-year-olds with a crash rate of 310. This trend continues with 50-59-year-old drivers (282) and even those in their seventh decade (60-69 years old) rating 256. Younger drivers have more accidents per mile driven than drivers in their 30s, 40s and 50s, and even 60s. If experience and hours in the logbook were all that mattered, this trend should continue unabated into the 70s and beyond. Unfortunately, the AAA study shows the trend line bending back upward as drivers entered their 70s and 80s, with drivers over 80 crashing about as often as drivers in their early 20s. The FAA’s analysis looked at numerous studies with differing methodologies. It was careful to note “mixed results,” but the one thing most of the studies had in common was that characteristic U-shape, with the upward trend not delayed into the 70s like the AAA study but starting in the late 50s. These analyses do contain some bright spots for current and future “old-timers.” Most of the silver lining is encapsulated in the FAA study’s section called “Caveats to Findings.” They are essentially possibilities and exceptions to the rule. They include the possibility that some of the data for pilots over 60 were unfairly skewed due to the age 60 mandatory retirement rules at the time. Pilots in that cohort were, due to the rule, operating in statistically less safe Part 91 and 135 operations. That’s not much consolation, I’m afraid. Also, the FAA caveats suggest that some pilots simply perform better than other pilots and that these variabilities in performance increase with age. In other words, we all get older and age takes its toll, but some old-timers hold up better under the strain. That’s good news if you happen to be one of those pilots. Unfortunately, for every Bob Hoover out there flying his Shrike Commander upside down while doing a crossword puzzle and eating a sandwich, there is a sagging RJ captain hunting for his reading glasses. Finally, the FAA analysis cites a 1994 study by Li and Baker that may give us all a glimmer of hope. Their study evaluated the effect of hours and recent experience on this whole sorry problem. Their research seems to suggest that hours in the logbook can flatten out that U-shaped curve. According to the FAA study, “the authors found that pilot age was not associated significantly with increased risk unless age was adjusted for total and recent flight time. Although this adjustment showed that risk increased with age, the authors reported that…greater experience keeps older pilots from being at excess risk.” That makes sense intuitively and is welcome news to a forty-something pilot. Unfortunately, as we improve with experience, there is a perverse law of the universe that insists that our bodies and minds will degrade. Age and experience go together. Age and decay do also. Am I a better pilot than I was at 100 hours? Yes. Am I a better pilot than I was at 1,000 hours? I still say yes, but somewhat less stridently. What about 10,000? When I have 20,000 hours in the logbook, will I be a better pilot than I am today? I wish I could be certain about that. There may well be a U-shaped relationship between age and accident statistics. As I ponder the future, though, I picture a different kind of chart, a vector diagram. We are the sum of forces. The upward vector of experience at some point in our lives meets the downward vector of lost mental agility, sensory impairment and diminished physical resilience. The resultant vector begins to bend toward the earth. We all know this. We may be older and wiser, but someday, on a date that we cannot easily ascertain, we cease to become older and better. Eventually there will be some cocky young First Officer who will lean over and say, “Can I do that for you, sir?” and not in a friendly, helpful way, but in an impatient, insincere way. We all hope that we will recognize that day before the world does. The effect of aging on aviation safety has been a third-rail subject since FAR 121.383(c)—better known as the “Age 60 Rule”—was implemented in 1959. It read: “no certificate holder may use the services of any person as a pilot…if that person has reached his 60th birthday.” The FAA has maintained that the rule was established to promote safety, especially in the era of faster, larger jet aircraft. They claimed that 60 was not chosen arbitrarily but based on the best scientific studies available at the time. Others, of course, have disagreed. Critics have cast a skeptical eye on the way the rule was made, calling it a payoff to powerful airline interests. Specifically, they have cited the close personal relationship between American Airlines Chairman C. R. Smith and the first administrator of the FAA, General Elwood Quesada. Smith was eager to replace older, more expensive pilots with younger, World War II- and Korean-era military pilots who would work cheaper and, he thought, adjust more quickly to jet aircraft. As it turned out, Quesada was willing to go even further, not only promulgating 121.383(c) but suggesting another rule allowing only military pilots to fly jet aircraft. Thankfully, this idea withered on the vine. Actual quid pro quo can be hard to prove, but critics of the rule were not surprised when Quesada stepped down as FAA administrator in 1961 and was, shortly thereafter, appointed to American Airlines’ Board of Directors. 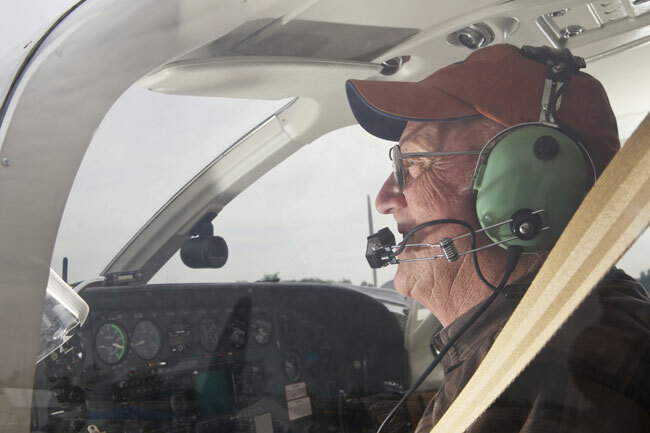 Among pilots, the “Age 60 Rule” has been a matter of strong, differing opinions. The Airline Pilots Association, who carried out the first “Age 60” battles with American, fought to overturn the rule for more than 20 years, taking the position that mandatory retirement should be based on a pilot’s actual mental and physical capabilities. Unions, of course, are composed of different labor groups with differing interests and priorities. In 1980, ALPA changed course and supported the “Age 60 Rule” for the next 27 years. Finally, in 2007, ALPA’s Executive Board voted overwhelmingly to end the union’s support for the rule. Why are we looking at the rule now? 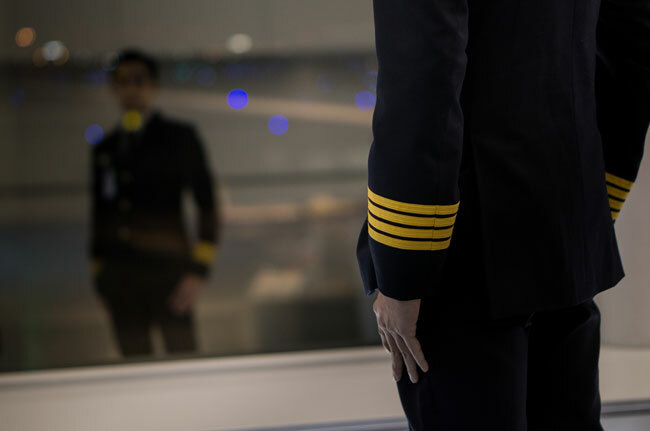 The Executive Board resolution lists several reasons, including the fact that the financial crisis in the airline industry has created a significant burden on tens of thousands of ALPA pilots’ retirement funds through decreased earnings and plan changes and terminations. The “Age 60 Rule” finally died December 13, 2007 with the passage of the “Fair Treatment for Experienced Pilots Act.” FAR 121.383(c) is no more. In its place is 121.383(d), which says: “no certificate holder may use the services of any person as a pilot…if that person has reached his or her 65th birthday.” Except for the updated gender neutral pronouns, all that changed is one number. Consistent with history and human nature, this elated some and irritated others. Dustin Joy is a captain for a U.S. regional airline and a former flight instructor. He lives in western Illinois with his wife and three kids, where he enjoys fishing, gardening and beekeeping, none of which he’s very good at. This one size fits all age rule has no provision for the 65 or older pilot who has kept his body in shape, especially one who has done an exceptional job of doing so. There are 40 year old out of shape, pilots no longer interested in improving their abilities. I was amazed when I flew a jet airiplane for the first time at how simple it was to fly a jet. machine without a constant speed prop and all the nav/system info available. Dustin I’m one of those age 60 pilots forced to retire in 2005, I find your article most interesting and one that I can relate too, thanks for the post.